"We knew it all along but now the message has been confirmed. According to the Audit Bureau of Circulation (the organisation which establishes the sales figures of national magazines) the Official UK Playstation Magazine is bought by a massive 41,925 people every month, and the figure is rising. This places us head and shoulders above the competition and makes this mighty organ the world's best-selling Playstation magazine. A good month for PSM then, but not so good for Playstation software. We've been graced with some of the lowest-scoring games we've ever seen. These blips in quality are inevitable, however, so fear not, for our Update and PrePlay sections are packed with some tasty morsels which are testament to the increasing strength of Playstation. Our advice is, be choosy, be fussy, be downright picky. Buy only the games recommended by the most popular Playstation mag on this entire globe, and even slightly substandard videogames will become a thing of the past." "Stronger, faster. Yet this sequel doesn't do enough to suggest that Takara has done anything than go through the motions. It's got Toshinden written all over it." "A slick, 3D chess game with some fine blasts of classical music. Some of the pieces are overly fussy but, hey, it don't matter. You know what you're getting. Chess." "A rather sloppy affair, sadly. We were all excited about this game until we played it. Await Resident Evil next month, readers." "The graphics are pretty in places but nothing we haven't seen before. A dated concept with very little in the way of entertaining gameplay." "In the words of Ferris Bueller's sister, 'Bite the big one, junior'. Extreme Pinball is the Beazer Homes League of pinball. Avoid, please." "Provides a challenging blast, but sadly one that is both dated and seriously flawed in places. Does nothing to enhance the reputation of the traditional shoot 'em up." "Inventive ideas, but lacks the slick execution to make this game an out and out delight to play. Grisly carnage abounds, but is overshadowed by glitches." "More action-packed than Namco's offering but lacking variety. There's no denying that some of these games are still the best way to while away an afternoon..."
- The current OPM's latest ABC figures (second half of 2008) are actually higher than those mentioned in the editorial, at 53,644 - though you have to bear in mind that the Playstation was still establishing itself over here back in mid 1996. Issue 42 with the Metal Gear Solid cover still holds the record for most copies sold of a single issue of a video games magazine - over 400,000. - Crash Bandicoot rears his head for the first time. "...one of the new breed of 3D platform games, Crash Bandicoot is set to go up against Nights on Sega Saturn and Super Mario 64 on Nintendo 64. And the good news is that, by all accounts, Crash Bandicoot may be the best of the bunch." - Psygnosis had a feature in the magazine for readers to rename their working-titled "Lemmings Platform". It would eventually be named simply Lomax in the EU. - One of the biggest franchises in gaming today got it's very first mention - Grand Theft Auto. "Grand Theft Auto is a frenetic racing game with a Micro Machines slant, letting you race through the streets of San Francisco as a cop, thief or juvenile delinquent. 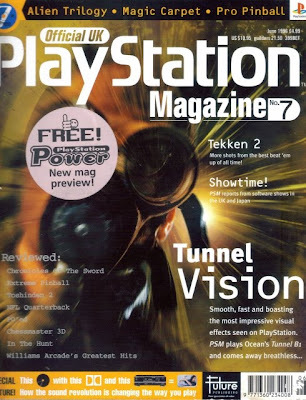 - This issue came with an 8 page preview of the soon to be launched Playstation Power magazine, which ran from 1996 to 2001. - This was Steve Jarratt's last issue.